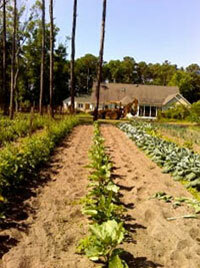 Above photo is the yard of a member of the OCBC. She does not wish to be named. 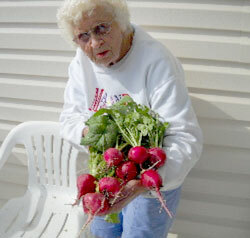 As you can see, she has a green thumb and, therefore, is a valued member. 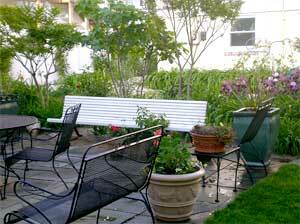 As a member her yard cannot be nominated for a beauty award. Above photo of Albright’s yard on Surf Avenue in Downtown Ocean City. 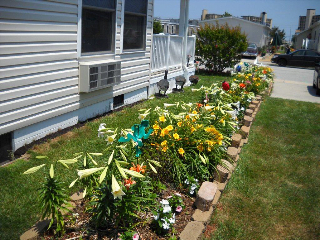 Jennifer Abright is a valued member of the Ocean City Beautification Committee, therefore she cannot be nominated for a Beauty Award. 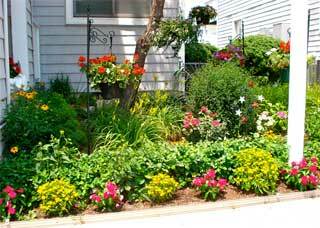 Her husband Jerry is the one with the green thumb and Jennifer likes to pick the flowers. 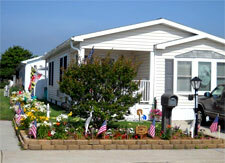 Don’t forget to nominate an Ocean City property that you like. 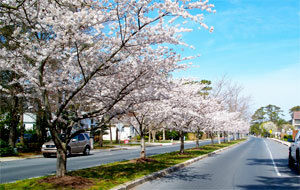 The Avenue of Cherries was an idea whose concept was originated in the Caine Woods Association to remove several Black Pine trees on the median that were thought to be unsightly. Through the organizing of Pat Moran, OCBC member and also a member of the CWCA the beautification Committee under the auspices of the TREEmendous Dedication Program decided to replace the Pines with colorful Yoshino Cherry trees. The Yoshino Cherry, native to China and the Orient is the same tree planted in Washington, DC and is famous for the Festival of Cherries each year in that city. 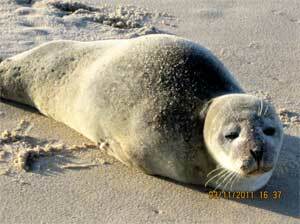 It is also noted that there are several pockets of Yoshinos planted around the Ocean City area. It usually blooms around the beginning to mid-April and is a delight to behold. The white with pinkish cast single blossoms provide a beautiful scene when viewed in full bloom and wherever several are planted together. Anyone who takes a ride down the 142nd Street corridor is bound to be impressed by the display these trees put on every year. Soon, the cousin of the Yoshino, the Kwanzan Cherry will began its regal appearance in the Town and with its Hot Pink “double” blossoms, it can be considered also a great addition to the beautiful of trees in our Town’s landscape. 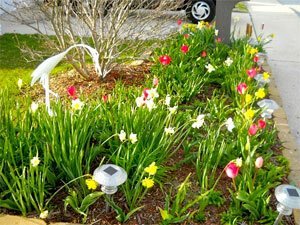 Spring has arrived at Bob and Rita Chapman’s home. 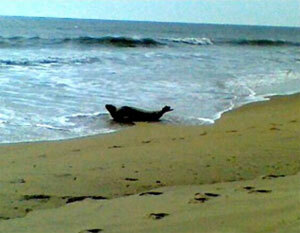 Seal seen at 131st beach by Michael Curcio on April 7th. on the 131st Street beach on March 11, 2011. To Rita, With Love, Bob. 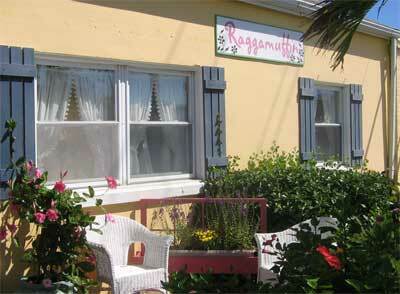 Sept. in Ocean City at Raggamuffin on 24 street Bay Side. Crimmons Realty is participating in Beautification Committee’s project supplying potted flowers to businesses where more greenery is needed. 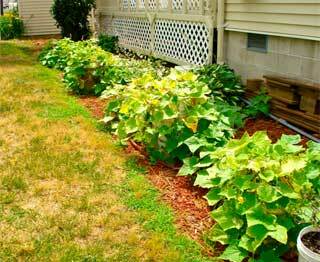 The committee requires volunteers to water the plants. 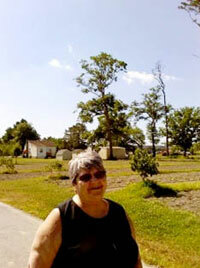 Pictured above is Lucy, a volunteer at this location. 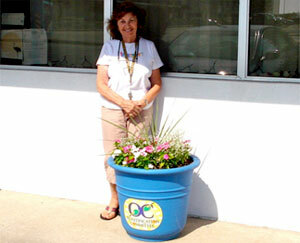 Bonnie Mitrecic heads the committee that provides our potted plants. Contact us if you are interested. I walked about one mile from my house and saw these beautiful trees and had to go back and take pictures to share with you. The trees are in Gorman Park located off 136th Street, Northside Park located off 135th Street and Hidden Harbour I on 123rd Street. All are on bayside. 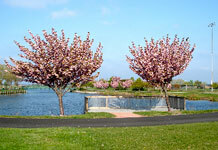 I found out from Gregory Purnell, Ocean City Arborist, that the trees arePrunus serulatta “Kwanzan” commonly called Kwanzan Cherry. They are cousin to the Prunus X yedoensisaka Yoshino Cherry (Washington Cherry Blossom Festival). I suggest you take a walk in your Ocean City neighborhood. 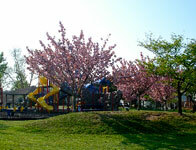 If you take pictures and e-mail them to the Beautification Committee we will post them on our website. 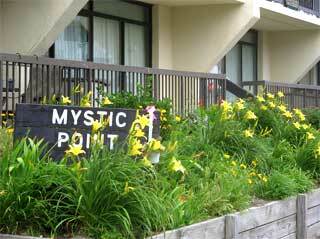 Hidden Harbour 2 on 123rd Street Bayside is a past Beautification Award winner in the Condo category. Josie and Charlie Argentino have been summer residents for over 20 years and have been donating their services maintaining the grounds. We are in the process of taking nominations for residential, condo, and business categories. To nominate just send us the address in Ocean City you think deserves an award making sure to include your name and phone number. All entries must be received by June 26th. The Beautification Committee will be around to judge soon after. 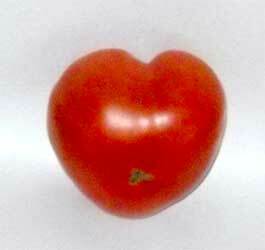 Beauty Spots must be nominated to be eligible for judging. Contact us. Robert Borys of Little Salisbury has a beautifully landscaped yard including pots of cucumbers which he grows every year. Looks like he will have enough to make pickles this year. Yellow, pink and orange lily’s. Black-eyed Susan’s, butterfly bush, pansies, mint, lavender,daisies and rosemary. I am always surprised they do so well so close to the ocean. Never know what will come up the next year. The Saint Anthony Lillies are right on schedule for their June 14th blooming date. 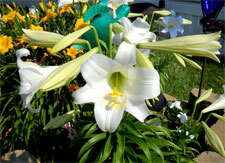 Over 100 of them with a mix of over 100 Day Lillies. Going with the Our Country’s First Lady there is also a vegetable garden of tomatoes and peppers to share the fruit of our labor with our neighbors. Also our neighbor 93 year old Mr. Bud also shares his tomatoes and peppers. The vegetables will come in about July 15th. 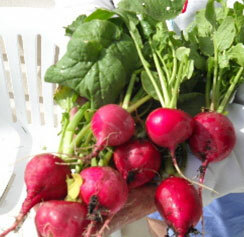 Rita Chapman showing us her beautiful radishes. Rita and Bob reside in Montego Bay and are regularly nominated and winners of our Beautification Committee awards. 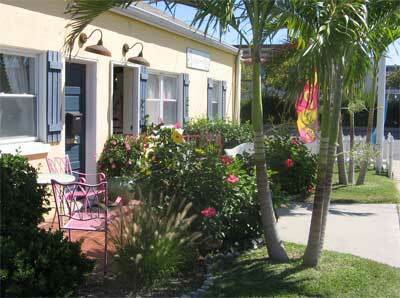 If you want to nominate an Ocean City property for an award just send the address to us at [email protected]. When we moved from our condo we had to take up our tomato plants. 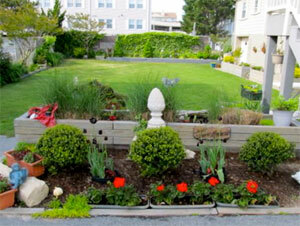 We gave two plants to Gerry Bailey at Bermuda Bay in Ocean City. She intended to replant them in her small back yard, but got the flu and just left them sitting in their pots on the ground. It you have a story for us, please send it to us and we will be glad to add it to our web site.